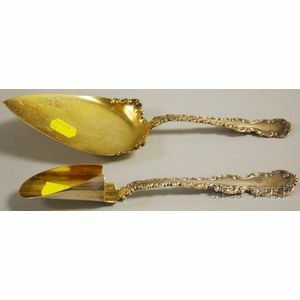 Boxed Pair of Whiting "Louis XV" Gold-washed Sterling Silver Flatware Servers, a solid pie server and a large cheese scoop, lg. 9 1/8 and 8 1/8 in., respectively, approx. 4.8 troy oz.